Bosnia and Herzegovina is a small Balkan country that comprises two autonomous entities: the Federation of Bosnia and Herzegovina and Republika Srpska. As a result, there are only two public holidays celebrated by the whole country: New Year’s Day and Labor Day. In addition, each of the autonomous entities has its own public holidays. 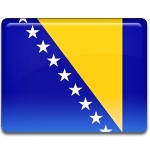 For example, March 1 is Bosnia and Herzegovina Independence Day. The dissolution of Yugoslavia was followed by turbulent changes in Central and Southeastern Europe. Some of the former constituent republics of the SFR Yugoslavia transitioned to independence relatively peacefully, while others found themselves engaged in armed conflicts. Bosnia and Herzegovina was (and still is) a multinational state comprising three ethnic “constituent peoples”: Bosniaks, Serbs, and Croats. Most Bosniaks identify as Muslim, while most Serbs and Croats identify as Christian (Serbian Orthodox and Roman Catholic, respectively). It was the country’s multinational nature that eventually led to the present-day division of Bosnia and Herzegovina. As Yugoslavia began to break up, a significant split developed among the residents of Bosnia and Herzegovina on the issue on whether to seek independence or remain within Yugoslavia. Bosniaks and Croats favored independence, while most Serbs preferred to remain within Yugoslavia. The Serb members of parliament even went as far as to split from the national assembly and form their own legislative body. This led to a significant rise in ethnic tensions. The Bosnian independence referendum was held between February 29 and March 1, 1992. The referendum question was whether the citizens were in favor of a sovereign and independent Bosnia-Herzegovina, where all the constituent nations were equal. The overwhelming majority of Bosniak and Bosnian Croat voters supported independence, while Bosnian Serbs either boycotted the referendum or were prevented from voting by Bosnian Serb authorities who didn’t consider the referendum legitimate. As a result, 99.7% of voters voted for independence. The independence of Bosnia and Herzegovina was declared on March 3, two days after the referendum, and received international recognition on April 6. Bosnian Serbs, however, didn’t recognize the results of the referendum, which led to the Bosnian War of 1992–1995 and the subsequent formation of two autonomous entities within Bosnia and Herzegovina. In February 1995, when the war was nearing its end, the parliament of the newly established Federation of Bosnia and Herzegovina proclaimed March 1 (the anniversary of the referendum) as Independence Day and a national holiday. It was celebrated for the first time on March 1, 1995. As has already been mentioned above, Bosnia and Herzegovina Independence Day (Dan nezavisnosti Bosne i Hercegovine) is a public holiday only in the Federation of Bosnia and Herzegovina. While Republika Srpska doesn’t dispute it as a holiday of the Bosnian people, it celebrates its own national day, named Republic Day, on January 9.